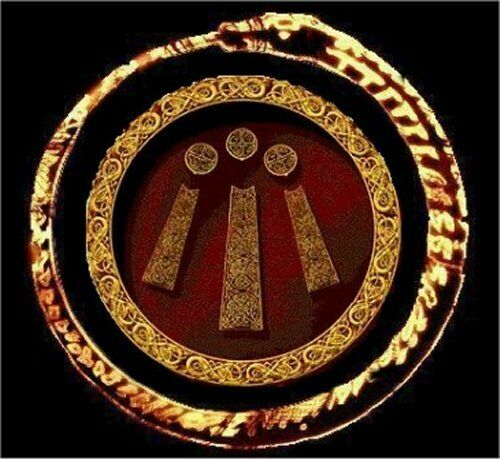 © 2006 by Ceridwen Seren-Ddaear, A.D.
What does Awen feel like? Is it related to the imagination? How does one know when one is having an Awen experience? Is it primarily a random, spontaneous thing? Or can it be “channeled” by conscious intent? Is it reserved mainly for poets, writers, artists, teachers, magicians, etc.? Or can anyone access this mysterious power? Generally when it happens to me, my first response is: “Whoa, where did THAT come from?” But then I try to stay in the moment and fully imbibe the experience, like sipping a fine wine – getting the most out of it – and then afterwards, I always send a “thank you” to the Universe for the inspiration. I find that when one shows gratitude for this wondrous blessing – for that is what it is to me – then the Universe “responds” by sending even more Awen! As all the world does sleep. That this darkness doesn’t keep. Sunny days seem far away. The secrets of this day. And urge the flame to rise. As the Sun returns to the skies. 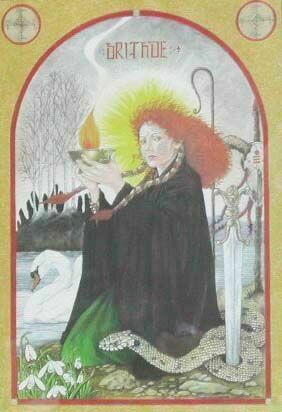 On this holy Imbolc night. And may we meet again. A Sabbat spent with friends. As I ponder what to submit to our lovely newsletter I was in a state of dismay because I know that everyone is working hard at his or her poetry, yet I wanted something different. Today as I stared at the Celtic Mandela Calendar I let my mind soften and followed the Celtic knotwork on that beautiful artwork and a thought occurred to me… I had the hit to start channeling 2 days ago, alas who shall I channel? Well today it hit me, my first goddess to channel should be Brighid. I did a small channeling a few months ago from Lemuria and it was well received. So… without further adieu I give you the gift this Imbolg season, a channeling of Goddess Brighid. 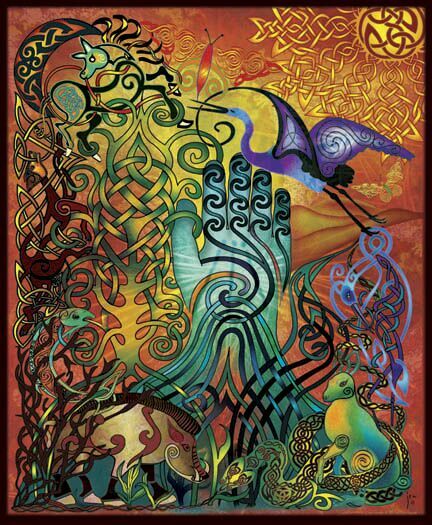 My dear children of the Tuatha, 'tis I Goddess Brighid, who comes before you today to announce to the world that I am truly alive in spirit and in the hearts of men, women and children and of the land. I think it is wonderful how you honor me at Oimealg every year, it and brings a glow to my rose cheeks and sets flame within my heart. A message for all you for this year especially during this turn of the wheel as many of you call it, brings inspiration. Inspiration from the heart. Please go deep inside your heart to find your messages of life. Go deep inside your heart and bring about love and truth, go deep inside your heart to write your fiction/non fiction stories and poetry. Go deeper yet and you will find yourself there loving and praying from your center. You will find dear ones that the truth of your life is instilled deep inside your soul, which is connected to your heart. I ask you to show mercy to those how cannot appreciate their own life, give love to those who feel abandoned. Offer hope to those who feel lost, shower all with blessings and love to all you meet. Feed those who cannot feed themselves, and shelter those who have no shelter at all. Today I give you a gift, a Gift of Inspiration. Close your eyes and count to 10 backwards, while spiraling downwards. By the time you reach 1 you will be in an area that is pitch black, yet there is life. To the east your feel and find a torch, as you light it from the snap of your fingers you light the eternal flame that sits within the center of this space. As the flame ignites, the room brightens and you look around you see a green glow surrounding you. Here in this room is the light of inspiration that shines from your heart into your soul. As you look to the west, there is tunnel that bends and curves downwards. Taking the torch in your hands you hold it to the eternal flame once more to re-ignite the flame. Then with torch in hand follow this down and you shall be in another room. This room is fully kindled just the flame burns low. Take the torch and touch the low burning flame, see how the flame is suddenly rekindled and bright! Put the torch in the flame for you no longer need it. As you stare into the flame you realize this is the flame of your soul. This is where you come to ignite those passions that you have so forgotten about. This flame will also entice you to bring back memories of lives of where you were a bardic writer and how you bring forth those qualities once more. This flame will entice you back to the times of when you were a bardic musician and help bring those qualities back into this time as well. As you touch the flame with your hands feelings of inspiration arrive to those who craft with their hands. Hands are ignited with the power of smithing by my power to your hands. For those in the healing profession breath in the flames of inspiration and let this be entwined with your soul in order to bring about healing for others. 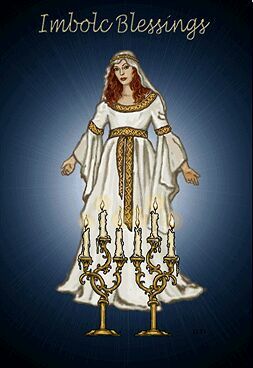 After you receive your messages and your gifts, the flame dwindles down smaller however it doesn’t lose its bright glow; you know it is time to leave. Give your gift of thanks and walk back up the tunnel to the first kindled fire. Give a gift of thanks to this fire as well and keep your most precious gift here in this room. You know have the means to come back and retrieve it willingly at your leisure and knowingly it will be used for the good of all. As you return to this physical world once more breathe in that message of inspiration deep into your lungs fill it up full and release with slow breath. Dear ones thank you so much for all your hard work during the years, and know that I am forever in your hearts. Know that all your work is not in vain for surely it will bring a change for the good in times to come. We are the stones that lie in the hills, the valleys, and the waters. WE are your allies. WE come to you in peace and We are here today to chat with you. We sincerely believe we add great power to your workings by adhering to our codes. WE store the necessary information that you gather and place within us as we too gather information and store within our cell memories. This Alban Eiler season is a special one because this is the year that stones are making a comeback in the Druid anthology. When Stonehenge was alive and bursting with flavor we too were alive since We are all connected. When Stonehenge was put to rest, We too were put to rest. However this year marks a major change within the stone culture. We are beaming with life again and We desire and need the touch of human’s mind to connect deeply with ours. We wish to present to you humans our knowledge of past connections and information. And today We offer you this guidance. Many stones have bits of information so in order to get the whole picture several stones must be spoken too. Not every stone contains all the necessary data to make the whole picture so to speak. Each one of us has our special coding. 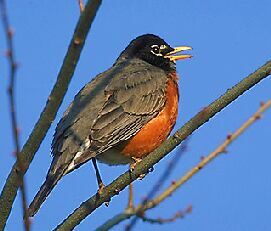 Some of us heal, some of us record, some of us speak, some of us research some of us even stay placed quietly, unnoticed and just simply observe the species surrounding us in our environment. WE present to you today some bits of advice. First and foremost be gentle with us an certainly be patient, our knowledge lies deep with in and for us to bring it to surface it takes a few moments. Do not strive to obtain all knowledge in one day, its virtually impossible. Do speak words of kindness to us when inquiring information. With this in mind lets proceed to what the other stones have to say. Message from Stonehenge: WE are the giants that dance in the winds of the time. We have survived many centuries of humans and earth evolvement. Contained within our stone structures are the memories of the Celtic race, their glories, their battles, their ceremonies and their fates. 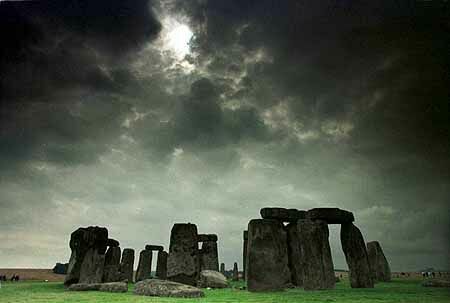 Also within our structure is the knowledge of the ancient druids that celebrated their seasons within our walls. Using your minds eye, reach out to the center of our being. From there one of us will reach out to you and feed you what you need to know about the timeline and their techniques. There will be stories, pictures, words, and symbols, it is up to you to distinguish the information and retrieve it properly. WE wish the earth human species to receive this knowledge at this time for it is their quest and thirst that drives them to succeed. You may make as many trips as you wish, as there is no limit however you will never receive the same information twice. Message from Crystals and the Gemstones: We are the healers of this planet, some of us are prized for our beauty and are stamped with a high price of monetary funds others are acquired for their healing properties, but under no condition are any of us less than the other. For we all share our own identity. True we are not as popular as the standing giants however we are still a very much human interest. Today we wish to bring you new knowledge to share. Go with your mind’s eye to the center of our being there you will find a inner crystal well, dive deep into that well, knowing that our rough edges will never hurt you. 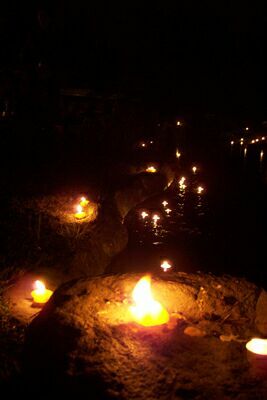 As you reach the core of our being you will see us glowing abundantly, chatting away, evening singing. 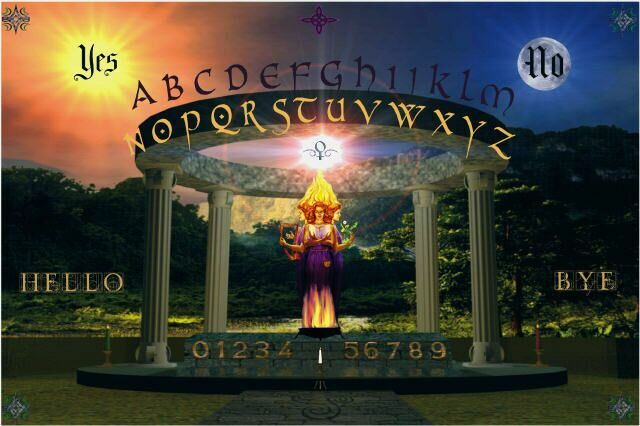 Listen with your inner ear and you will hear the ancient knowledge being presented to you. Absorb this through your own core and let it mingle and let it delve deep into your cellular structure. Bring this up to your heart and treasure it always. Message from the Sedona Stones: We are the Red Rocks that stand in the hot desert sun. WE too have seen ancient civilizations come and go and all their ceremonies, lives, and energy are stored with in us. Humans say we are a vortex when actually we are merely a catalyst for the energy to continue to exist. Here within us lie the ancient truths of civilizations of the various galaxies that have visited us; it is from them that we have gained our power. Come! Closer! Come with in our walls, and see the symbology left behind! 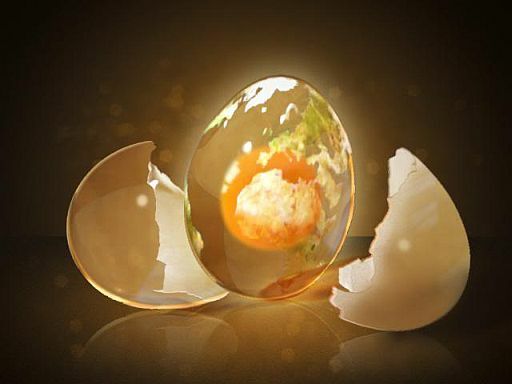 Decipher the meanings that the first beings on earth left behind. See how they relate to your present life. Message from the lesser stones: WE are the lesser stones that are usually forgotten about, we are the river stones, the standing granite, the garden stones and the pebble on the side of road. We too have a purpose on this earth and we too contain knowledge from eons ago. Today, We would like to share this with you. And make it known that WE are a vital source of information, if you only ask. Look around you We are everywhere! Perhaps it may not be the arcane knowledge of the Druid-hood but of ancient civilizations of your area. WE are here and WE desire to work with you, if you only give us a chance. Reach, reach out, harder! Make contact, talk to us! We will share with you what we know. This ends the transmission of us stones. From this day forward each of you will becoming in your own power while receiving the vital information necessary to enhance the next stage of your growth. Awen inspired me to narrate a story that would appeal to young people (and/or any beginners in the study of the 22 paths) of the Fool's journey through the Major Arcana, relatively in the "traditional" sequence. 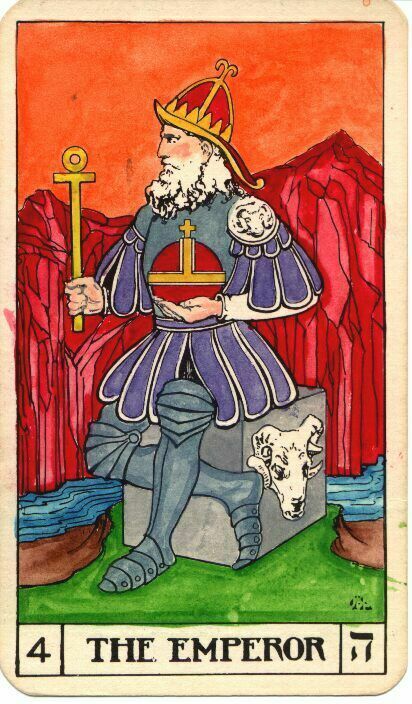 The images in the story were inspired by the Paul Foster Case Tarot Deck from the Builders of the Adytum Mystery School. They came with the designs already outlined in black and white, and I painted them with watercolors - following the explicit instructions from the lessons)...some of them are a bit aged and sun-faded, but not too bad, considering that they are made of 30-year-old posterboard! 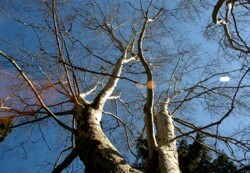 His next awareness of himself comes shortly after his “leap of faith.” He is on a dirt road lined with stately elm trees. Whistling merrily, he walks along, smelling the fresh country air and buoyed by a sense of adventure. 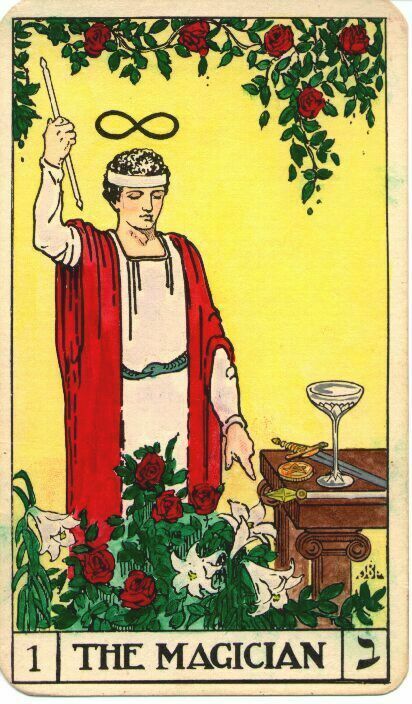 Eventually he encounters a young man standing beside a table, his right arm raised, his right hand holding a wand, his left hand pointing downward toward a garden of lilies and roses. His eyes are closed and he seems to be in deep concentration. The Fool waits patiently until the young man becomes aware of his presence and opens his eyes – and what compelling eyes they are – gazing at him (or into him) with unfathomable wisdom and love. 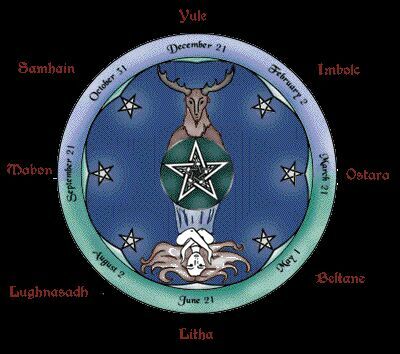 Thoughtfully placing the pentacle in his pouch, the Fool continues on his way. The land begins to change as the road becomes an uphill grade. The trees thin and sculptured gardens come into view - in the center of which is a small temple. Something about the way the light refracts off the walls and the aura of serenity surrounding the place beckons to the weary traveler. Intrigued, he approaches the structure. The pillars, one black and one white, are silhouetted against the sunset sky; hanging between them is a veil with a most curious design printed upon it – pomegranates and palms – but what really captures the attention of the Fool is the ornately-dressed woman seated in front of the veil on a large stone cube. 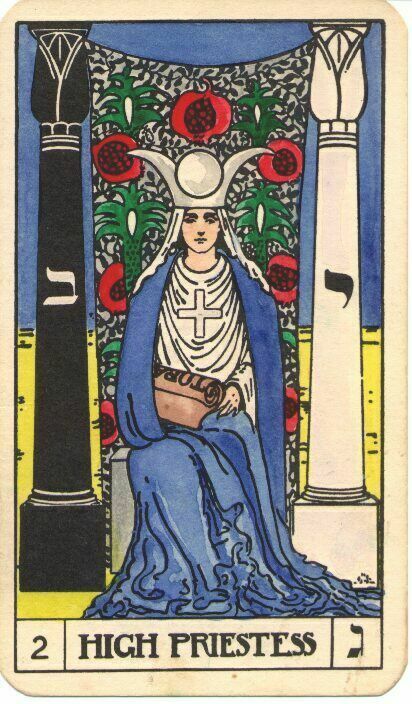 Her attire resembles that of a High Priestess: the crown of silver on her head, showing the full moon and its waxing and waning crescents; her long blue gown with bits of white mixed in – it looks like moving water as it trails away from her feet; he can’t see where it ends. She holds in her lap a parchment scroll, which she is reading. A great calm surrounds her - in the fading light she appears almost translucent. 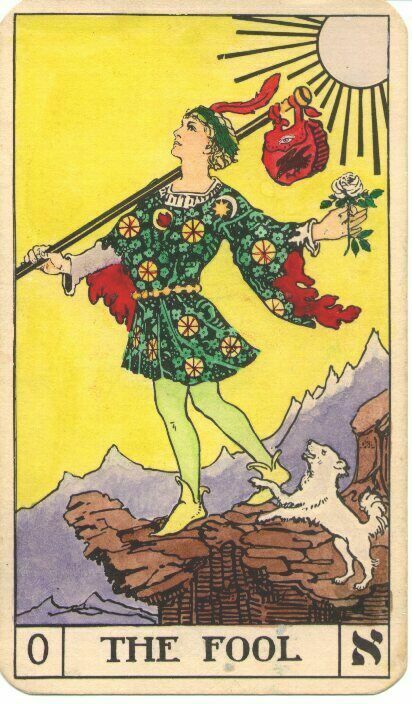 The Fool is awakened by bright sunlight and birdsong. Stretching lazily, he watches for a moment as the pretty little creatures do their aerial dance. Upon rising and looking around, he sees a river that he hadn’t noticed before – it seems to originate from the direction of the temple he left the night before. Ever curious, he follows the flowing water to see where it might take him. The vegetation becomes more prolific and varied, and occasionally he stops to pick some berries to eat along the way. The once peaceful river is flowing more and more quickly, becoming a churning rapids. He continues along it until the land gives way and the water pours off the edge, becoming a powerful waterfall! Peering down to where it resumes its rivercourse, he is struck by the incredible vista before him – it is lush with all types of vegetation, but particularly a golden field of ripening grain – and right in the middle of this colourful scene sits a woman, dressed in green. Again he follows the river as it meanders through the lush growth, leading him ever closer to the mysterious lady. She seems to glow in the morning light – especially just above her head, where he counts twelve stars above the crown she wears. He almost needs to shade his eyes – so bright is she to look upon! 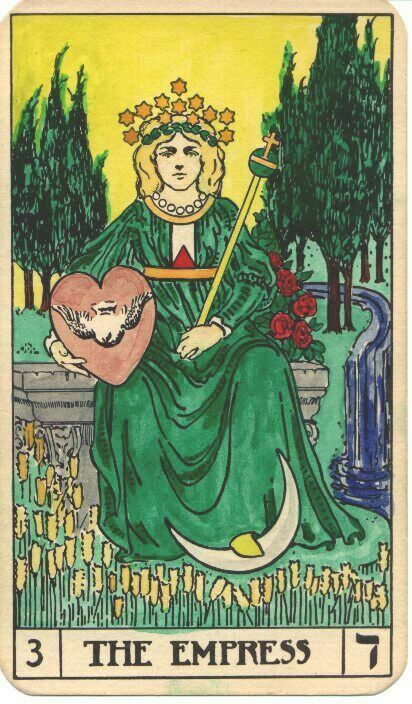 The green of her gown is the vibrant shade of the first leaves of Spring; the bronze heart-shaped shield she carries under her right arm reflects like a mirror; her face has the glow of one who is pregnant, new life stirring within her. 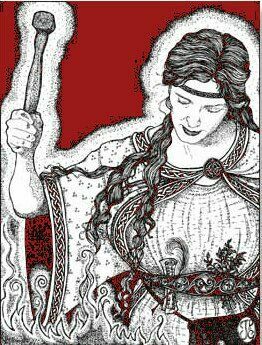 In her left hand she holds a small sphere. As he approaches, she gives him a joyful greeting. “Welcome to my garden, young traveler! What a fine thing it is to have company on this beautiful morning!” He is slightly surprised at her exuberance, particularly after the quietness and non-verbal nature of his interaction with the High Priestess. Quickly recovering his composure, he gives her a friendly bow and returns her greeting. He notices that her eyes are the same bright green as her gown, and there is a mischievous twinkle in them. He is overcome by a sudden compulsion to laugh! She joins him, and the sound of their laughter fills the valley. “But how…?” The Fool looks suspiciously at the river, then back at her. “Fear not,” whispers the Empress, “You will see her again.” She reaches out to brush a single tear from his cheek before helping him to his feet. He smiles shakily, but is heartened by the absolute confidence in her voice. After catching and eating some fish from the river, the Fool heads up into the foothills. The river is now far below and a rich turquoise colour. The mountains are bright red – in sharp contrast to the green he left behind. The air is becoming thinner and increasingly arid; high overhead, the sun is baking down on him. Removing his cloak and wiping his forehead, he climbs ever higher, when suddenly he sees a glint of light, golden in colour. Never one to keep from satisfying his curiosity, he heads in that direction, ignoring the steepness of the climb and the increasing pain in his feet. Sweating profusely by now, he finally reaches the flattened top of the mountain and finds that the golden light is caused by a crowned helmet reflecting the noonday sun. On top of the dome-shaped helmet is the astrological symbol for Aries, and beneath it sits a powerful-looking man dressed in armour. There are ram’s heads on his tabard and on the front of his throne. Regally surveying his realm, he holds a sceptre in one hand and an upside down Venus symbol in the other. A formidable presence he has, and the Fool is hesitant to approach him. Energized once again, the Fool feels a renewed urgency to find the cave before nightfall so he hurries on again. Before long, he comes to the bridge. The river is relatively calm here so he takes advantage of the chance to fill his waterskin and has a good long drink before proceeding across. 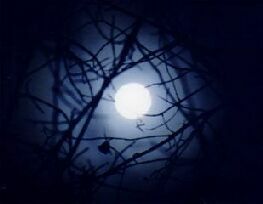 Luckily, the full moon is rising to light his way along the narrow riverbank path – he can just make it out. Just when he starts to think that he’ll have to give up for the night, he stumbles upon the cave. “Finally!” he sighs as he shivers from the cold evening air. Unfortunately, he has no torch to light his way, so he cautiously steps into the dark, feeling his way along the damp wall. Without warning, a swarm of bats flutters loudly past his head and out into the indigo sky! Instinctively ducking and covering his head, the Fool waits patiently until they are all gone before moving on. He awakens with a start – the sun is shining through the opening, enough for him to see his surroundings and remember where he is. Something else had awakened him, however; something just at the edge of hearing…then he hears them again – bells! The deep, rich sound is coming from a small archway to his left. Rising stiffly and brushing himself off, he limps toward the portal and looks inside. There is a narrow hallway, glowing slightly due to the phosphorescence of the rocky walls. Curiosity overcoming caution as usual, he decides to see where it leads. Again the sound of bells reaches him, growing increasingly louder. Quickening his pace, he follows the sound until he comes to a dark, wooden door with esoteric symbols carved into it and a huge brass knocker in the shape of a bull’s head. The door creaks open as if some invisible hand is pulling it, and he timidly enters. Before him is a huge chamber with a high, vaulted ceiling, and at the far wall is an intriguing scene: an imposing figure in priestly robes, a three-tiered mitre on his head, an impressive-looking staff in his left hand, his right hand raised in the sign for blessing. He is seated upon a stone throne with bull’s heads carved into the sides. Before him are two men on their knees, looking up at him in supplication – one has lilies on his robe; the other, roses. The cleric gives the kneeling men a subtle signal and they get up and leave through a side door – then, smiling, he beckons to the Fool to come forward. As he approaches, the young quester is filled with a sense of deja’ vu – this man’s face is somehow familiar to him, but he can’t quite remember…oh yes, the dream he had last night – this was one of the faces that spoke to him! Almost unbidden, the image of the bridged halves of the brain appears before his mind’s eye for a brief instant, then disappears. “What is the meaning of this recurring picture?” he asks out loud, momentarily startled by the sound of his voice. “Intuition is the bridge that connects the logical, rational left brain with the creative, telepathic right brain,” answers the cleric, his voice again seeming to come from within the Fool. “Who are you?” queries the young seeker, feeling strangely transparent to this man. 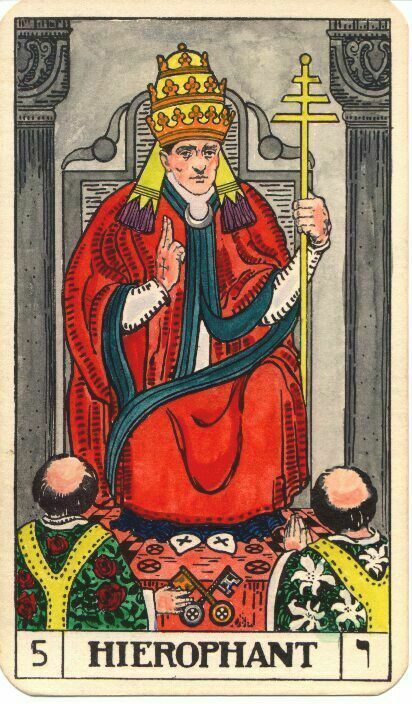 Filled with an increasing sense of well being and trust, the Fool relaxes and thinks about what he has just heard. At first, he considers telling the Hierophant the nature of his quest, but then he realizes that this man most likely already knows more about his quest than he does! Suddenly he finds himself standing in a valley – completely naked – and not very far away stands a woman, facing him, equally naked! Above and between them, floating on a small cloud, is an angel, arms outstretched over them both. Goddess who shines against the night. Her sacred flame is kept by one. 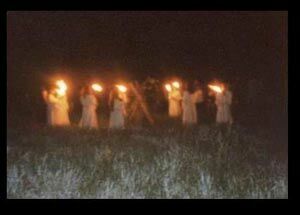 As sacred springs come forth the ground. And now the Goddess has returned. Born of her heart that bears her name. Triple Blessed by fire and water. Poets call her name to inspire. And healers oft gain from her fire. As hammer and anvil ring like a bell. When first she brought to Eire keening. Burn for Brigid, for Brigid Bright! Fire in the head...to quicken us. Fire in the cauldron...to heal us. Fire in the forge of the heart...to temper us. I have recently completed my training to become a Reiki Master, and have been teaching classes and passing along attunements to some of the local Pagans in our area. The simplest definition of the workd Reiki is: Universal or Spiritual (Rei) Life Force or Energy (Ki). 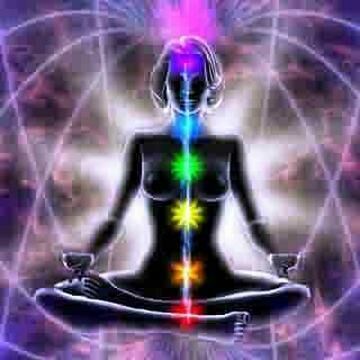 The Reiki system is a simple and powerful modality of energy work that anyone can use for developing physical, emotional, mental and spiritual harmony and wholeness in themselves and for assisting others. Reiki functions on the energy body first, usually following acupuncture and acupressure meridians but is not limited to them. The practitioner uses the Reiki energy to help people move and balance energy, remove blocks, repair tears in the aura and help restore health and well being. The Reiki practitioner places their hands on or near the recipient and "runs" Reiki energy while placing their hands over a series of locations on the recipient's body. Reiki flows through the practitioner, but is not generated by the practioner. The beauty of this - and what separates it from other healing modalities - is that, since you are not using your own energy, you don't get drained! You are merely a "conduit" - a clear channel or vessel - for the energy to flow through. Advanced practitioners are able to give treatments without touching the recipient, and can even send treatments long distances, even to people on other continents. Anyone can channel healing energy. This ability can be acquired by an energetic transmission from one person (a Reiki Master) to another (a student). These transmissions are called "attunements", or "empowerments", or sometimes, "initiations". An attunement transmits the ability to channel Reiki and clears any energy blocks to that ability. Anyone can get these attunements and channel Reiki. It requires no special abilities, and is a reliable way of doing healing treatments for yourself and others. Reiki is not a substitute for medical treatment, nor is it a diagnostic system. 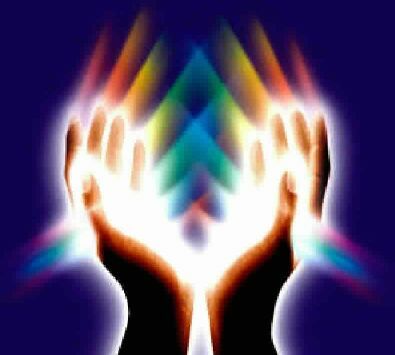 Reiki is an "intellent" energy of love and wholeness, and will go where it is needed. 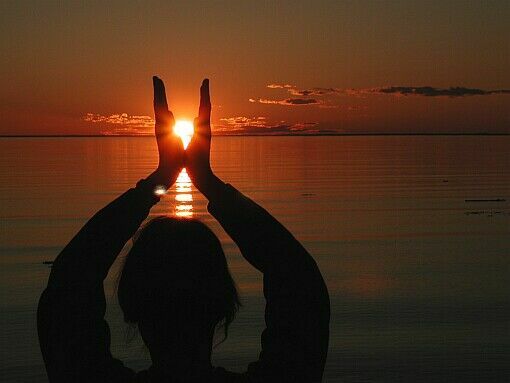 When you use Reiki, you will find many creative ways to work with and gain value from it. 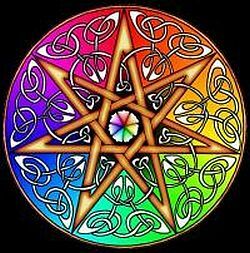 Druids can "charge up" their magickal tools, jewelry, crystals, altar, etc. with this energy, and it is also great for cleansing a sacred space, or for helping you to ground and center yourself and get your chakras balanced and spinning! There are 3 Reiki levels, or "degrees" - each one more complex than the one before. I personally have found that it greatly enhances my Druidic path - in fact, it can blend seamlessly with any religion or lifepath, as it is not a religion. Not only does it involve healing, but also it raises the vibration of your physical body and all of your subtle bodies, continuously fine-tuning and strengthening your connection with your higher self, guides and the All That Is - even when you are not directly using it. In fact, it was originally taught long ago as a path to enlightenment - and the healing part came as an unexpected, but pleasant side-benefit! 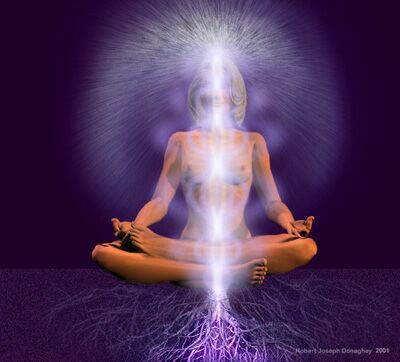 I have noticed some profound changes in myself since I began channeling this energy. I am even more even-tempered than usual, more grounded and balanced, and am making decisions in my life that are helping me to move along more efficiently on my spiritual path. I do two complete self-healing sessions per day - first thing when I wake up and the last thing before I go to sleep. The affects are cumulative, and if you keep a journal, you will find yourself quite amazed at so many subtle changes in a relatively short period of time! The uses for this energy modality are limited only to one's imagination - in other words, they are infinite! You can bless your food with it, charge up your vitamins or meds so that they will work more efficiently in your body...you can Reiki your computer and other electronics...you can Reiki your pets and plants...your car...anything you can think of can benefit from this energy. 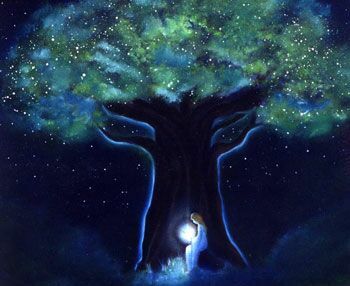 In fact, it's one of the nicest things you can do for your favourite tree(s), or for the Earth Mother in general - and we all know that She can use all the healing energy she can get! Isn't that one of the things we Druids feel called to do? 23 members are eligible for ordination into the First Degree. Click the above to read it, (scroll down about half way or so) then use your back button to return here. God’s do not die, though sometimes they may appear to be dead. And so it was that the Cailleach, who knew this only too well, took the comatose Dalon Ap Landu to a far off place, a place where he would be born anew, a place where she knew they would honor the young God. 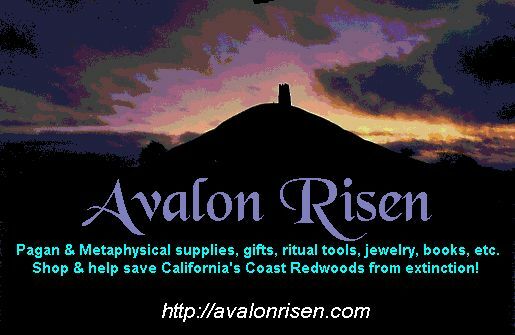 And it came to pass that the Cailleach brought the comatose body of Dalon Ap Landu to a place known to human kind as “Big Basin Redwoods State Park,” in the area of North America known as California. It was mid March, near the turn of the century. Two magicians sat together in the park, amongst the Old Ones, having partaken of much Guinness Stout and a little bit of Garberville Purple. They were drawn to a “fairy ring,” a circle of Redwoods all growing from the same root system, once owned by a long dead old growth, who is but a memory now. In the center of the ring the pair thought they could see a faint glow. A pair of antlers could be seen laying sideways, as if their owner were taking a nap. The magi backed off a bit, as there was nothing more dangerous than a startled buck Elk. As Elrond backed off though, he stepped on a twig. 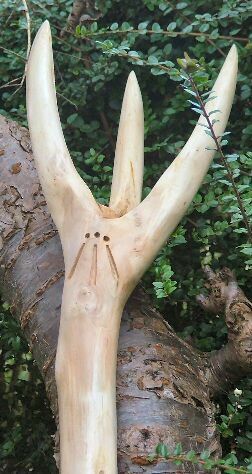 “Snap” went the twig, the sound being heard for yards around. Suddenly the Elk stood up! But it was no elk, nay, it was what looked like a man wearing the antlers of an elk. But Adam and Elrond knew only too well that this was no man they looked upon, it was a God! 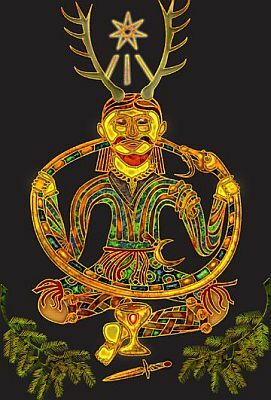 Perhaps Cernunnos or Hern? But no, this God was not as tall or as old looking as they would have expected the elder God of the forest to be. Indeed, they were right for this was Dalon ap Landu, reborn and refreshed. He stood before them in the moonlight. Young, strong and commanding, and yet, serene, like a Buddhist monk. And he was glowing with the light of Awen, emanating from a single star – with seven points. 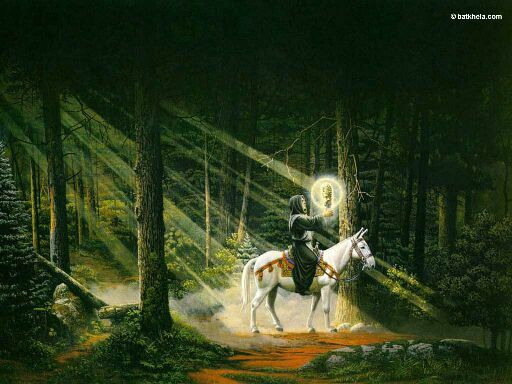 And so it was that Adam Walks Between Worlds and Sybok Pendderwydd encountered Dalon ap Landu in the great Redwood forest and founded the Order of the Mithril Star. It must have been three AM at least, and I was having trouble staying awake. Suddenly, I heard a noise from what seemed to be a few yards from my campsite. I sat quietly, my entire attention riveted towards the source of the sound - a "fairy ring" that I had purposely camped close to. I thought I could see antlers between the great trees, both in the shadow and in the light of the Full Moon. I heard a rustle in the trees, and then a voice: "Ceridwen, daughter of the Goddess, are you here?" It was a male voice - a human male voice. Was I tripping? I heard it again: "Ceridwen, daughter of the Goddess, are you here?" A voice inside my head, my spirit guide I believe, nudged me to answer, but I was too awe-struck. Once more the God inquired: "Ceridwen, daughter of the Goddess, are you here?" Finally I said, "I am here, Lord!" And out of the fairy ring, a mystical portal, appeared a tall naked man. Naked except for some jewelry, and covered in wode. A living snake hung around his neck like a chain. But most remarkably, he had antlers! "I am called Dalon Ap Landu!," he said. "I am patron of those Druids called to the Priesthood." "I know who you are Lord," I said, my heart pounding in my chest. "Thank you for attending my vigil." 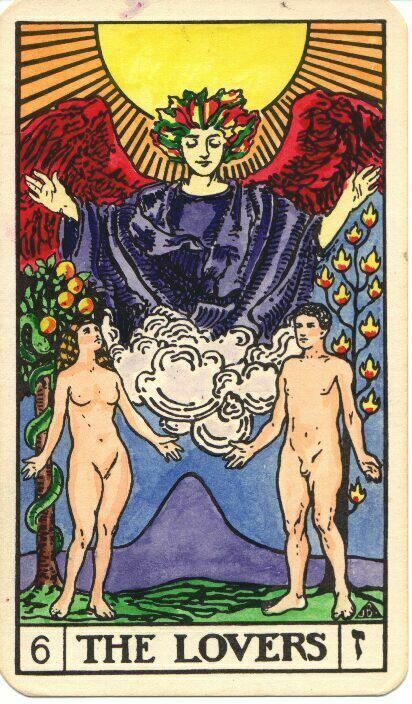 "It is my pleasure my lady," said the God, "I have a message for you, and I have someone I want you to meet." "A message, m'lord?," I said, wanting to give all due respect. "Yes, m'lady," said Dalon, "But first you must meet my friend." Then, on the Redwood nearest me, which must have been at least 1,000 years old, judging from it's great gerth, a burl began to glow with a soft green light. As it glowed, it grew into an oval shape, and as I watched, fascinated, I could see that it was also a portal. Within it I began to see a shape forming. The shape was that of a woman, and she appeared as if stepping out of the tree itself. "Is she a Dryad?," I thought to myself. And lo, as she took form in the moonlight, I could see that she was in fact a Goddess. The most beautiful woman I have ever seen. Her naked body was framed by the longest red hair I have ever seen. On her body was painted various symbols, spirals, triskelles, some of which I recognized and some I did not. On her forehead, on the place called the "third Eye" was seven pointed star in silver. Dalon spoke: "Her name is Sequoia, and she is the Goddess of the great coast Redwoods and Queen of the elves, faries and devas that live in these ancient forests. It is she that has a message for you, and a mission for those whom you will soon lead..."
Even today Dalon and his friend Sequoia can be encountered in the Redwoods of Humboldt County, a few hundred miles north of that first meeting place of the mithrils. Here today a Druid candidate for the third order, in vigil as preparation for that calling, is very likely to encounter one or both of them while in vigil, for they are waiting for you in the trees of Redwood National Park. 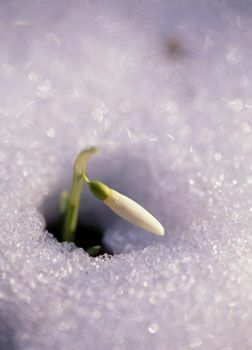 Today is Imbolc, or February 1, 2006 CE. 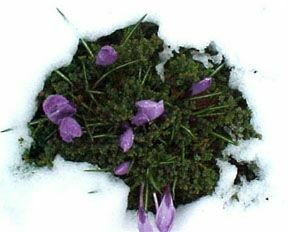 It is the 1st day of the Season of Earrach, and the 1st day of the Month of Mi na hOimelc. It is also Wednesday, in the common tongue, or Dydd Mercher in Welsh. It is the Druidic day of the Hazel. NEW MOONS occur on 28 Earrach, 57 Earrach and 86 Earrach. FULL MOONS occur on 13 Earrach, 42 Earrach, and 72 Earrach. The Sun enters Pisces on 18 Earrach. Honorary Reformed Druid and environmental hero, Julia Butterfly Hill was born 18 Earrach YR 12. Honorary Reformed Druid and filk-Bard Leslie Fish was born on 39 Earrach. She is the author of our official hymn, "Sequoia Sempervirons." Order of the Mithril Star was conceived on 44 Earrach YR 34, at Big Basin Redwoods State Park (Boulder Creek California). "Bring Back the Snakes Day" observed, 46 Earrach. Ostara / Alban Eiler, or the Spring Equinox occurs on 48 Earrach. 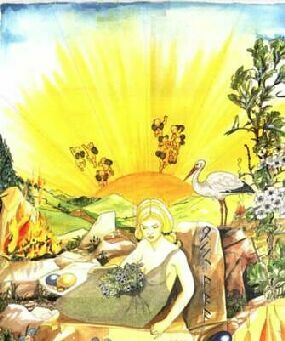 The Sun enters Aries on 48 Earrach. Daylight Savings Time begins on 61 Earrach. The Sun enters Taurus on 78 Earrach. Earth Day is observed on 81 Earrach. 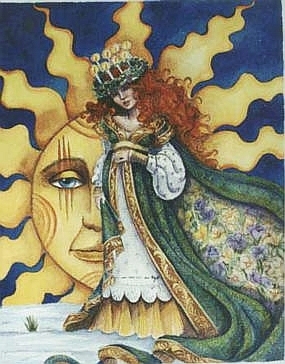 The Season of Samradh, the first day of MÌ na Beltaine, 1 Samradh 44, the Festival of Beltane begins at Sunset on April 30th. May the light of love and devotion shine brightly in your hearts. May the light of understanding shine in your minds. May the light of harmony glow in your home. 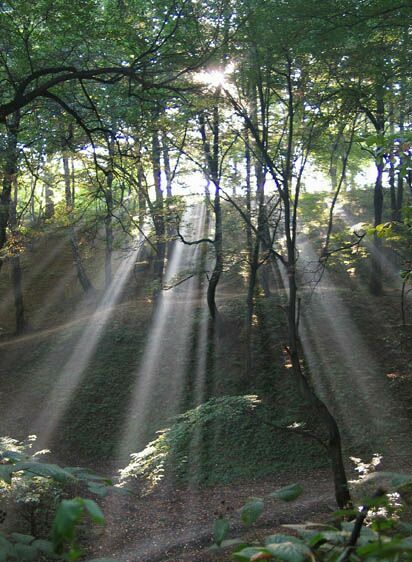 May the light of peace emanate from your being. 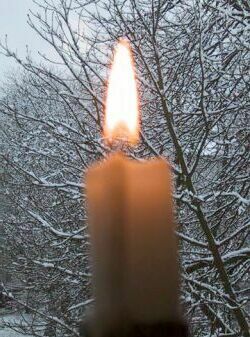 May your presence light the lamps of love and peace wherever you go.